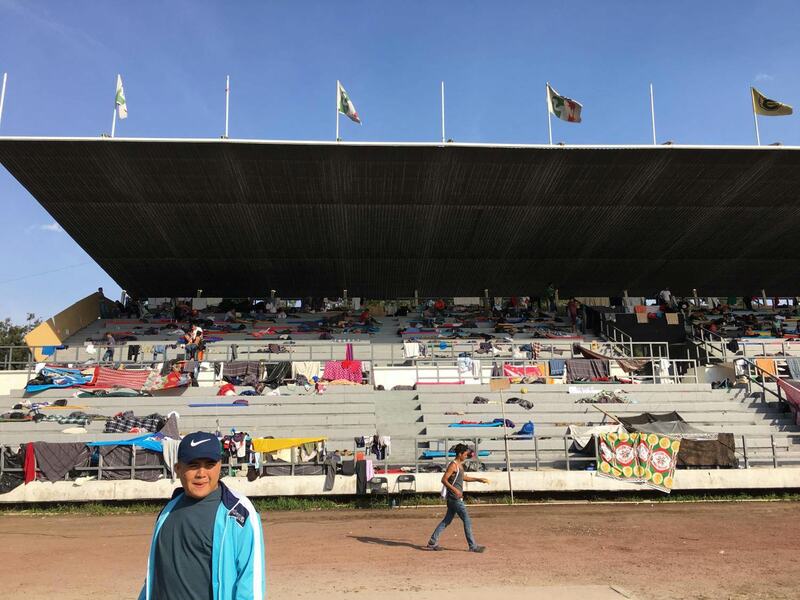 Mexico City officials set up a shelter for migrants in a stadium for a week in November 2018. The last caravan that got President Donald Trump's attention made its way north in November, with more than 6,000 people entering Mexico, many of them having lived tragic stories, like that of Rosario Garcia. Garcia, a young mother from the Honduran capital of Tegucigalpa, made a living washing neighbors' clothes and taking care of their children, she said. And on good week, she could earn the equivalent of $30 — half of which she would have to surrender to a gang operating in her neighborhood, she said. Which is why she wound up traveling on foot, her 11-year-old son, Gibson, in tow, taking the chances migrants take, of being kidnapped or assaulted while hoping to reach the United States, she said. "I know the risks we're taking," Garcia said while resting at a shelter in Mexico City. "I'm at a point where I don't want to keep going forward, but I don't want to go back either. I'm doing this because I want my son to have a better life." Mexico is caught physically and politically in between the harsh realities pushing people out of northern Central America and the divisive political drama of immigration policy in the United States. The caravans of migrants hailing from Honduras, El Salvador and Guatemala are becoming increasingly visible and common. More than 30,000 people from Central America entered the country last year, a majority of them with the intention of reaching the United States, Interior Secretary Olga Sánchez Cordero said. 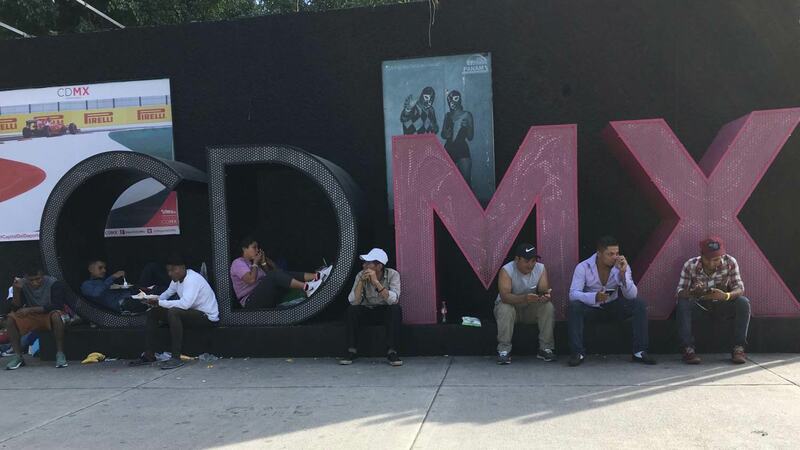 VIEW LARGER Migrants make use of seating at a Mexico City shelter in November 2018. Mexico's own enforcement has not been consistent in recent years, with authorities giving one-year visas to many of migrants that arrived with a caravan to the country's southern border this week. Authorities have also deported more than 500,000 migrants to Central America since 2014, denying virtually all of them due process, access to legal aid or humanitarian assistance, said Elisa Ortega Velazquez, an immigration law professor at the National Autonomous University of Mexico. "Every day there's a silent caravan," Ortega Velazaquez said. "The Mexican government should do something very soon." President Andrés Manuel López Obrador’s administration is promising $25 billion for a joint plan with the United States, Guatemala, El Salvador and Honduras to develop economic opportunities to slow down migration from the region. The American government has pledged $10.6 billion through public and private partnerships, in the form of grants and loans. But with Trump’s focus on the wall, is there any way the Mexican president’s plan could stay on course in the United States? Antonio Garza, a former American ambassador to Mexico, was part of meetings for a plan led by former Mexican President Vicente Fox in the mid-2000s for development throughout Central America. "A couple of things line up pretty positively. It's not a tremendous amount of new money, and it involves the private sector through some loans and guarantees," Garza said. "I think you'll see some movement on the project." Mexican Foreign Relations Secretary Marcelo Ebrard has called for a cabinet-level meeting between the five governments by the end of January. The foreign relations ministry would not confirm whether the meeting has been scheduled. Still, a key question over any plan is for how long all parties will stay on task. "If it's sustainable, and it's really going to impact people's lives," Garza said, "it has to be here for decades."